President John Kroger braces for impact as rubber ball of doom hurtles towards its target. Photo by Alex Krafcik '15, courtesy of the Quest. 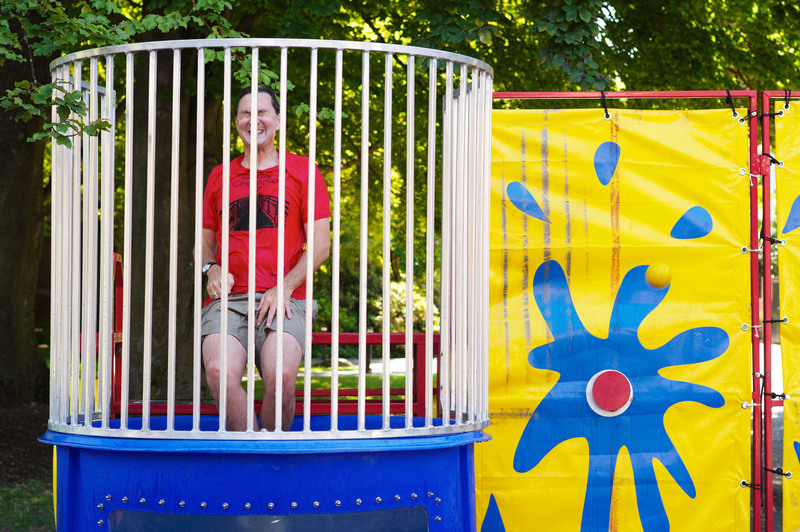 Students took aim at President John Kroger last week (and we don't mean metaphorically) when the new prez sat in a dunk tank to raise awareness for the student group Reedies for Reedies. Perched on a minuscule platform, clad in trunks and a red Orientation t-shirt, Kroger shivered with anticipation as Reedies lined up to throw rubber balls at a bull's-eye target from a distance of roughly 15 feet. "Shouldn't there be some kind of qualifying question?" Kroger asked as a husky freshling stepped up to the line. "…uh, name something Wittgenstein wrote!" After a moment's hesitation, Peter Gunnar '16 shrugged and decided that Kroger's negotiating position was weak. He hurled three balls in rapid succession, nailing the target with his final pitch, plunging the presidential corpus into the icy tank, which provoked a lusty roar from the crowd. "We're privileged to have such a fun-loving president," Peter said afterwards, as Kroger, considerably moistened, climbed out of the tank and ventured back onto the platform to face the next critic. The event took place in the Quad as part of the semi-annual Activities Fair, featuring tables and booths from a myriad of campus groups and clubs, including Bike Co-Op, Weapons of Mass Distraction (fire dancers), GreenBoard, Reedies for Sexual Health Awareness, and the Quest (which is, believe it or not, now in its 99th year of publication). An ice-cream truck provided frozen dairy refreshments to the tune of The Entertainer. Dean of Students Mike Brody reacquaints himself with the pilomotor reflex after full-body immersion during Activities Fair. Photo by Ben Corner '14. 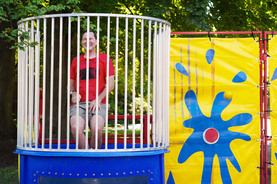 The idea of dunking the president—and other campus luminaries who succeeded him in the tank—originated with Amzar Abdullah-Faiz '13, who reckoned it would be a good way to highlight Reedies for Reedies, the student group that raises money from students each year to provide a need-based scholarship for a worthy student. 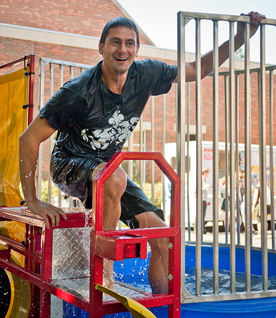 Also taking the plunge were Dean of Student Services Mike Brody, Student Activities Director Kristin Holmberg, Campus Safety Officer Jess Dimiceli, Student Body President Brian Moore '13 and Amzar himself, who declared that the water was "freaking cold." Alex Blum '13 contributed to this article.